DETROIT – Chevrolet Performance has released a comprehensive collection of factory-engineered performance parts and accessories for fifth-generation Camaros, 2010 model year and newer. Many of the parts preserve the vehicle warranty when installed by a Chevrolet dealer – an advantage aftermarket installers cannot provide. The portfolio of parts is designed to make "Gen 5" Camaro V-6 and SS models more capable on the street and track and includes components from the high-performance Camaro ZL1 and the road racing-oriented Camaro SS 1LE package. For customers interested in drag racing or high-horsepower projects, Chevrolet Performance offers the new ZL1 rear driveline system. It is the strongest independent rear axle option available for the Camaro, featuring a 9.9-inch rear differential mounted in a robust cast iron center section (vs. the aluminum center section in SS and V-6 models) and additional high-strength components. For customers interested in road-racing or improved handling, Chevrolet Performance offers suspension components from the Camaro 1LE, which is homologated for competition in SCCA’s T2 class. The same components in the Chevrolet Performance 1LE Track Pack enabled a production Camaro SS 1LE to circle Virginia International Raceway in less than three minutes. The parts are available directly from Chevrolet dealers, which can be found on the dealer locator at chevroletperformance.com or chevrolet.com. ZL1 front brake kit for Camaro SS (part number 22959672) – It includes racing-style front two-piece, 14.6-inch front rotors and six-piston Brembo calipers with aluminum housings and ZL1 logo. The kit includes two rotors, two calipers, brake pads and mounting hardware. It is a direct replacement for Camaro SS. It works with production chassis controls, including StabiliTrak, traction control and antilock brakes, and does not void the vehicle warranty. ZL1 rear brake kit for Camaro SS (part number 23104466) – It complements the ZL1 front brake kit with ZL1-logo calipers. The kit includes two calipers, brake pads and installation hardware. It works with production chassis controls, including StabiliTrak, traction control and antilock brakes, and does not void the vehicle warranty. ZL1 front/rear brake kit for Camaro V-6 (part number 22989384) – Upgrades the front and rear brakes for 2010-and-later Camaro V-6 models with the 14.6-inch front and 14.4-inch rear brake components from the ZL1. The kit includes two front, two-piece rotors and six-piston calipers, two rear single-piece rotors and four-piston calipers, brake pads, master cylinder and installation hardware. Twenty-inch wheels are required for caliper clearance. It works with production chassis controls, including StabiliTrak, traction control and antilock brakes, and does not void the vehicle warranty. ZL1 short-throw shifter (part number 19299460) – Quicker, more precise-feeling gear changes are enabled by the ZL1’s 5.1-ratio shifter. It is a direct replacement for the six-speed manual transmission shifter in the Camaro SS. Does not void vehicle warranty. ZL1 low-restriction air filter element (part number 92229651) – Direct replacement for the air filter element in 2010-13 Camaro SS models, enhancing LS3/L99 engine performance by reducing induction restrictions. It does not void the vehicle warranty. ZL1 fuel pump (part number 19260557) – Fits all 2010-and-later SS and V-6 models. This twin-pump design is designed meet the high-rpm fuel requirements of a supercharged engine. It delivers approximately 250 liters per hour at 65 psi (450 kPa). ZL1 rear driveline system (part number 22959394 for manuals and 22959395 for automatics) – This is the ZL1’s complete rear axle system, which is significantly stronger than the Camaro SS rear axle system. The kit includes a larger, stronger 9.9-inch ring gear with a heavy-duty limited-slip differential in a cast iron housing; stronger driveshaft and stronger asymmetrical half-shafts, which include a 60mm hollow shaft on the right and a 33mm solid shaft on the left. Their different torsional stiffness rates work in conjunction with the limited-slip differential to minimize the chance of wheel hop at launch. The kit is a direct bolt-in for the Camaro SS and V-6 models, although additional parts may be required for installation. Manual transmission kits feature a 3.73 axle ratio and automatic transmission kits have a 3.23 ratio. 1LE Track Pack (part number 23123398 for V-6 and 23123397 for SS) – This suspension kit features the same suspension components used in the production 1LE performance package. Content includes a larger, 27mm solid front stabilizer bar, and 28mm solid rear stabilizer bar for improved body roll, retuned front struts and new monotube rear shocks for improved body and wheel control, and stiffer toe links and rear shock mounts for improved performance. It works with production chassis controls, including StabiliTrak, traction control and antilock brakes, and does not void the vehicle warranty. 1LE strut tower brace (part number 22756880) – This bolt-on component fits 2011-and-later Camaro SS and V-6 models, delivering greater stiffness to the front body structure to enhance the turn-in feel and supports quicker, more direct-feeling steering inputs. Does not void vehicle warranty. 1LE PCV valve (part number 12653073) –Ensures oil separation and drain-back during high-load cornering. Does not void vehicle warranty. SS brake kit for Camaro V-6 (part number 23120542) – Upgrades the front and rear brakes for 2010-and-later Camaro V-6 models with the Brembo front and rear brake components from the SS. It is a more economical option for customers who want greater brake performance, but don’t need the performance of the ZL1 brakes. The kit includes two front rotors and calipers, two rear rotors and calipers, brake pads, master cylinder and installation hardware. It works with production chassis controls, including StabiliTrak, traction control and antilock brakes, and does not void the vehicle warranty. Developed by the same powertrain engineers who work on Chevrolet’s motorsports programs, this power-building kit was developed as a direct replacement for the factory-installed heads and camshaft on 2010-and-later Camaro SS models, adding up to 40 horsepower. The kit includes CNC-ported LS3 cylinder heads, which flow more than 350 cfm (intake side) with 276cc intake runners and 2.165/1.590-inch valves. 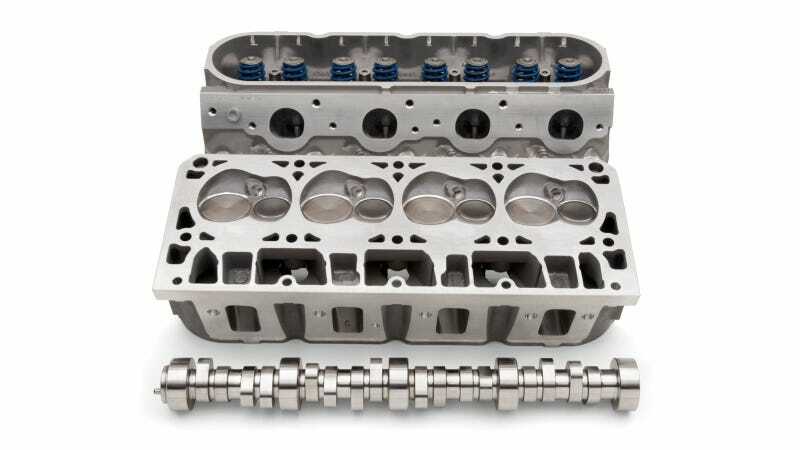 The high-lift LS7 camshaft makes the most of the heads’ airflow capabilities, with 0.558/0.558-inch lift and 211 degrees/230 degrees duration at 0.050-inch and a 121-degree lobe separation angle. Contents include the camshaft and fully assembled cylinder heads. Head gaskets and cylinder head bolts must be purchased separately. Tuning is required. This kit fits other LS-family engines with at least 4.000-inch bores. Chevrolet Performance also offers many of the specialty and high-performance components used in the COPO Camaro, allowing racers to build their own Camaro race car. They include components such as the unique COPO Camaro hood (part number 22950678) and COPO-logo gauges. For the latest news on the COPO Program and new parts, sign up for the COPO Camaro mailing list at chevroletperformance.com.